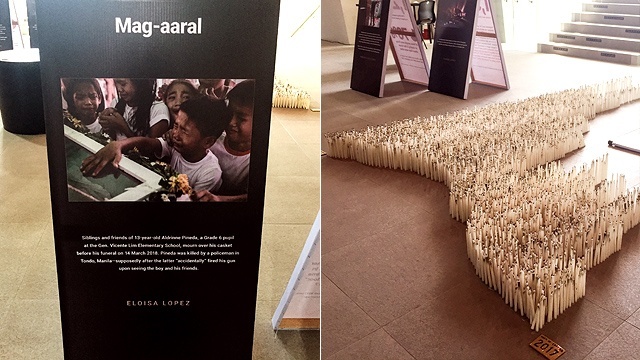 Ateneo de Manila University's Exhibit on "War on Drugs"
Catch it until August 26 at Areté, Ateneo de Manila University. 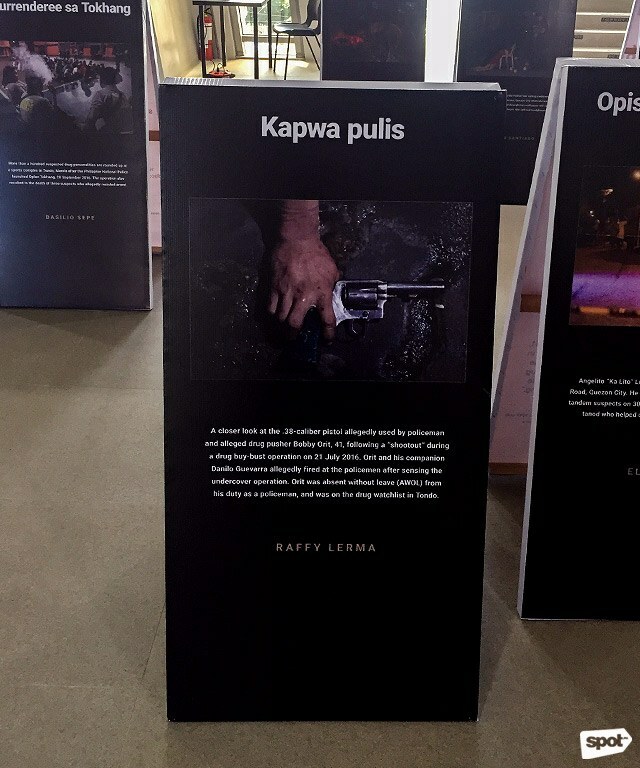 (SPOT.ph) Ateneo de Manila University makes known its position on the controversial “war on drugs” through a tell-all exhibit on the third floor of the George SK Ty Learning Innovation Wing at Areté. 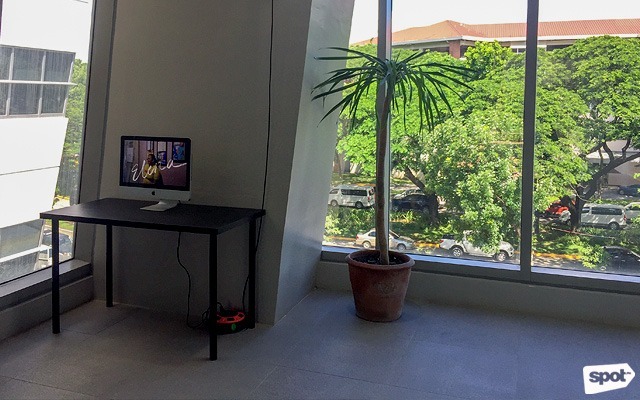 Aptly titled What We Talk About When We Talk About the “War on Drugs,” the multimedia display runs until August 26 and is open to both Atenean and non-Ateneans. It is true when they said that "a picture is worth a thousand words." At first glance, the exhibit seems sterile. Guests are greeted by a dozen captioned photos, printed on tarpaulin and stretched over the kind of A-frame sign normally used for advertising restaurant specials. Against the backdrop of Ateneo’s campus greenery coming through the space’s floor-to-ceiling windows, the initial impact of the display is underwhelming. But give it a second. This restrained and understated exhibit will move guests of all kinds in a powerful way. Though it has a politically loaded title, the collection curated by Karl Castro does not engage in the chaotic debate that audiences have come to expect when discussing the “war on drugs.” In fact, its sterility is deliberate—stripping the “war” down to its bare bones. In an age where fake news and alternative facts are the norm, this exhibit refreshingly seeks to give the public access to unadulterated truth. 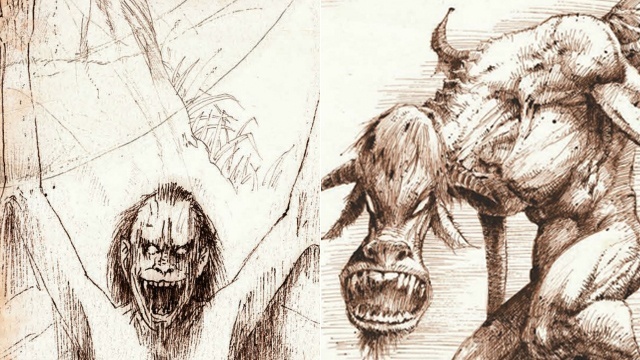 "This exhibit presents numbers, images, and stories. But not answers," the tagline says. The main portion consists of the A-frame signs. On one side are photographs from eight contributors. These photos depict scenes from the “war”—including funerals, detention centers, and bloodied streets. Each is titled according to demographic: Bata, Kapwa pulis, Mag-aaral, et cetera. 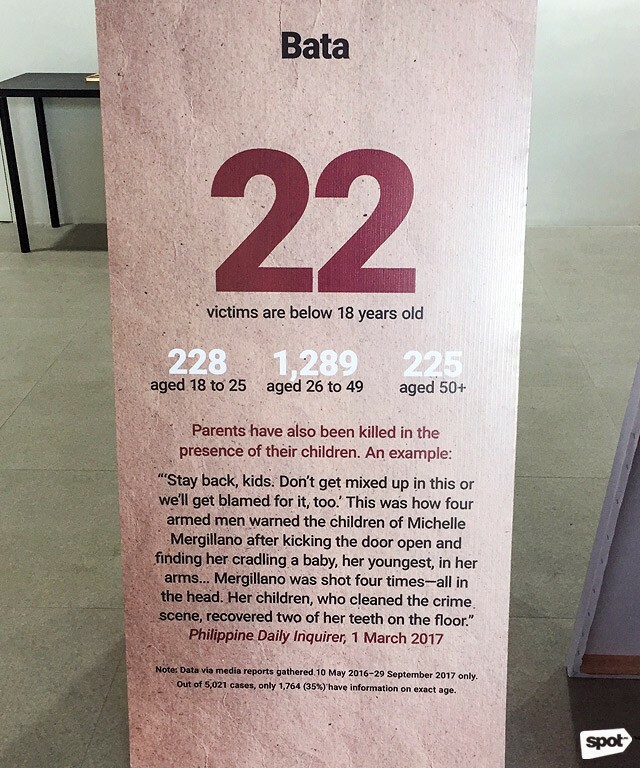 On the other side of each A-frame are statistics compiled by Ateneo Policy Center about how each demographic has been affected by the “war.” For instance, on the Bata A-frame, it shows that between May 2016 and September 2017, 22 children were killed as a result of the “war.” In the same period, the Kapwa pulis A-frame shows that 107 current and former police officers were killed. The statistics paired with the faces of the casualties humanizes the data, while also showing the immense scale of lives lost. The Drug Archive is a research collaboration by the Ateneo School of Government at Ateneo de Manila University, De La Salle Philippines, the University of the Philippines-Diliman, and the Stabile Center for Investigative Journalism at Columbia University’s Graduate School of Journalism. In addition to the numbers, there is an interactive computer console in the main area of the exhibit. 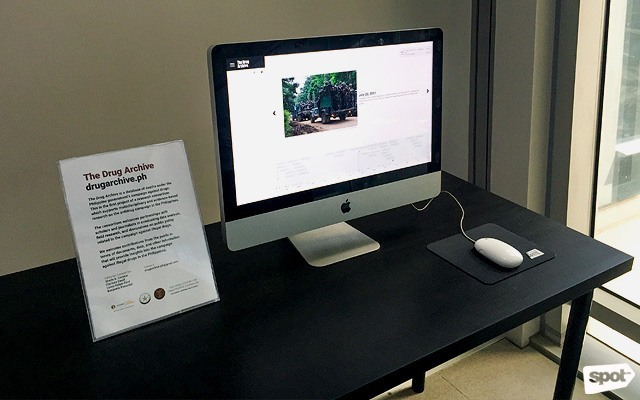 Guests are invited to scroll through The Drug Archive, a research database of “deaths under the Philippine government’s campaign against drugs.” Like the A-frames, this portion of the exhibit also provides names, dates, and other vetted, evidence-backed pieces of information. The most compelling portion of the site is the timeline of the anti-drug campaign, which has been updated until June 2018, and is packed with a staggering amount of violence. 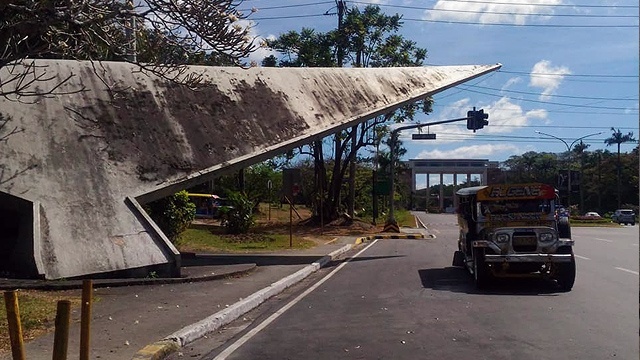 The films are from the School of Slow Media and the Psychological Association of the Philippines. Meanwhile, tucked away in opposite corners of the exhibit space are two mini-documentaries that depict non-violent approaches to drug addiction. “Elena” is a four-minute film that shows how one woman overcame addiction to become a leader in her community. Meanwhile, “Katatagan Kontra Droga sa Komunidad” is a two-minute film that describes the availability of recovery programs for those battling addiction. Without inserting any opinions from the exhibit curator or the filmmakers, the power of these mini-documentaries lie in their observational format. Audiences can clearly see that it is in fact possible for people with addictions to change for the better. One candle represents one life. 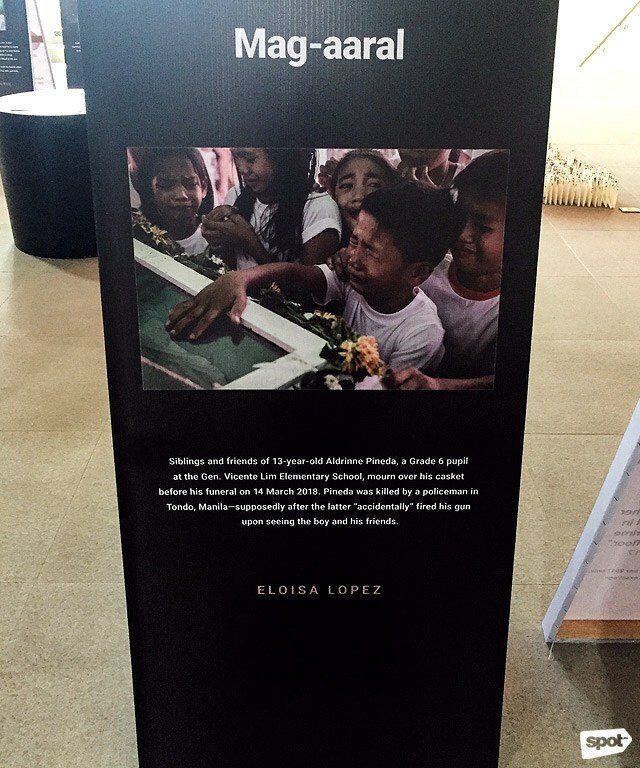 The most impactful part of the exhibit, however, is the art installation at the center of the space. 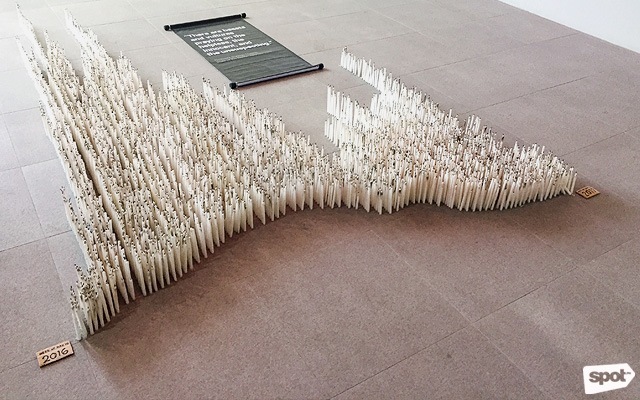 Exactly 5,021 snuffed-out candles are arranged to form a graph of the killings from May 2016 to September 2017, with each candle representing one life. 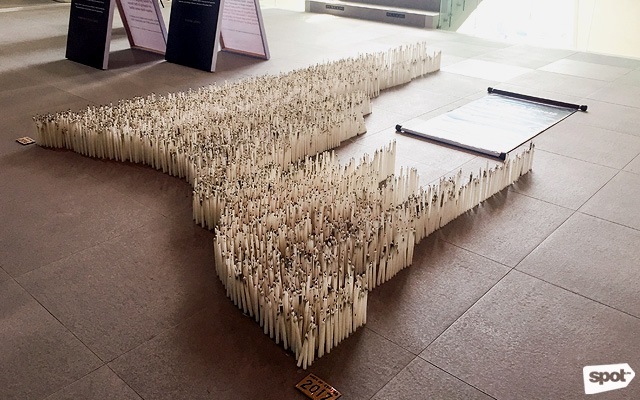 Although the exhibit does not directly condemn the killings—and in fact, people who support the “war on drugs” may actually deem the data to be a record of the administration’s success, the stories alongside the statistics force the audience to ask themselves important questions. Why are we allowing our fellow human beings, including children, be slaughtered like this? What does it say about us, as individuals and as a nation, if we do nothing to stop it? 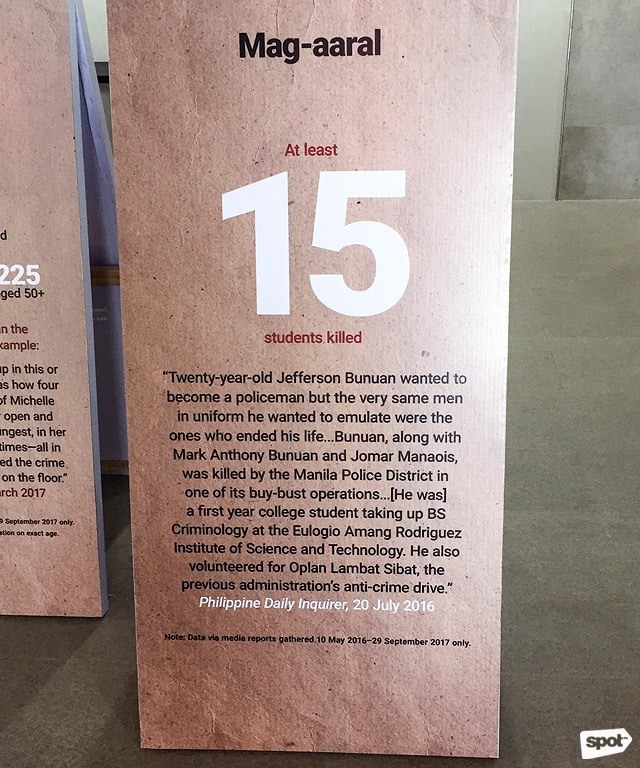 What We Talk About When We Talk About the “War on Drugs” runs until August 26 at 3/F George SK Ty Learning Innovation Wing, Areté, Ateneo de Manila University, Katipunan Avenue, Loyola Heights, Quezon City. For more information, follow Areté on Facebook.